Being a nursing mum is hard and just like all hard things,it comes with its unique challenges. You do not have to fit into a perceived norm. So long as your choices do not lead to you neglecting your baby then you owe no one an apology. Here are seven things no nursing mum should ever apologize for. (1) Loving your job. You are supposed to be engrossed with caring for your baby but you rather have your mind on your power-point presentation, your shop, or wherever your duty post is. So long as your baby does not suffer for it, please go ahead. It shows fulfillment in your chosen career. Your baby should be better-off for it in the long run as he/she would likely have a happy mum(which rubs off on children), and a more financially stable home. Your career should not suffer because of motherhood. I once witnessed a midwife who herself just gave birth less than 24 hours before go to assist in delivering the baby of another mother in labour . She still had that legs-apart gait many mothers with recent episiotomies have, but she went to help save at least two more lives. That to me was beautiful and meant she loved what she does for a living. There are certain women who sitting at home can drive crazy, you owe no one an apology if you fall into that category. No one wants a crazy mum. (2) Furthering your education. I have seen mums use the opportunity of maternity leave to round-up their studies or enroll into a fresh one. Education, just like a career is tasking and can take you away from your baby . We all at one time or the other need some form of self improvement, do not let nursing a baby deny you an opportunity to do that. Just ensure your baby is in good hands when you are not disposed to attending to him/her. (3) Choosing not to exclusively breastfeed your baby. Feeding your baby on breast milk alone for the first six months has proven time and again to be the best way to feed a baby, but for certain reasons, some mothers may not be able to keep up with it. You do not have to be shamed into what you cannot afford doing or do not want to do. Go ahead and supplement with formula but keep it in mind that your option is not the best available but is good nevertheless. And you owe no one an apology because no one but you wears your shoes and therefore you alone know where it pinches. (4) Breastfeeding in public. Most mums can identify with that moment when your child refuses to be pacified except by your jugs, Please go ahead and feed the baby. Yes you can be discreet and do your 'thing' without baring it all. But if there ever exists a situation where you have to choose between baring it all and not feeding your baby, please choose the former. Anyone embarrassed by the sight should look the other way. (5) Feeling overwhelmed. Nursing and motherhood in general can be overwhelming.Simply get someone to help you with your baby when you think you are on the verge of breaking down, then take time out to rejuvenate. 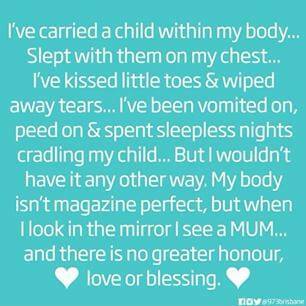 It is completely normal and does not stop you from being a super mum. Your baby needs a sane and happy mum so you should do what it takes to retain your sanity. (6) Calling your baby's doctor at the slightest sign of discomfort. It is okay to be a bit paranoid when it concerns your baby's health. It is better a concern is dismissed by the doctor than have a health issue aggravate because you do not want to disturb anyone. Never belittle your mummy-instincts no matter how many times it has sparked off when there was little or no cause for alarm. Never apologize for wanting a healthy baby. (7) Your post-baby body. It is great if you can get your pre-pregnancy body back, but there is absolutely nothing wrong with stretch marks that refuse to clear, extra weight that has refused to burn and the baby bump that has refused to completely flatten. And when anyone makes a negative remark about how you look post-baby, remind the person of the maternal mortality statistics in Nigeria and the fact that making babies in Africa is not a feat for the weak-hearted. You should never apologize for not getting back you pre-pregnancy body. That was well said. Ride on ma'm . I love number 3 most. Many exclusively breastfeeding mums have a nose-in-the-air attitude towards those who supplement. Memoirs of an Nigerian Mum : Jedi Jedi, Nra, Ela.